If you fly just over Amity University, Noida, you would see routes brightly surrounded by luscious greens and buildings pervasively topped with solar panels. 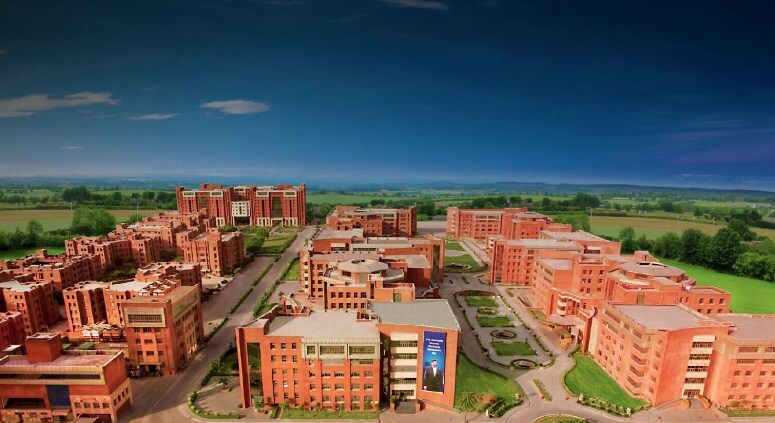 Amity University was founded by Dr. Ashok Chauhan, a magnate who heavily invested in West Germany following to the collapse of the Berlin Wall. He spent twenty-eight years in Germany, but he returned to India in 1995 with a vision to create an innovative, private university with a global reach. Not only does the university have Indian campuses, among them being Gwalior and Jaipur, but it also has international campuses, among them in London, Singapore, China, and Romania. That is quite the accomplishment for any university system. Uniting all these campuses is Amity University’s distinct mission to combine modernity and tradition, to synthesize technological advancement and culture. The administration certainly tries to keep culture present in the minds of the students. After all, Amity University’s website says that they are, “passionate about grooming leaders who are not only professionals but also good human beings with values and sanskars.” It also provides students with a short book named “101 Traits and Virtues”. It teaches soft skills that students would probably need after graduation, such as getting along with people in a workplace. Most universities tend to emphasize primarily the subject-oriented aspects of education, such as the content of a physics course, but Amity University strongly stresses personal development as well. This philosophy is analogous to that of liberal arts programs in the West. Dr. Chauhan himself criticizes the Indian educational system for placing such an emphasis on what he believes to be rote memorization. Instead, he wants to experiment with education that emphasizes adaptive thinking – the processing of information as opposed to the storage it. In addition, Amity University, Noida holds a decisive modernity that is immediately present in its architecture. The J1 block features a state-of-the-art ASCO Studio, where there is a community radio station that broadcasts at 107.8 FM to the public. In addition, the bathroom in the building housing the F1, F2, and F3 blocks is actually rather elegant, which is not something anyone would expect from most universities. Finally, the research facilities and rich library have generated over six thousand research publications, so it certainly has a place for many scientists and researchers to explore the depths of their fields. That initial juxtaposition of solar panels and green fields acutely illustrates the mission of this university, which is to integrate seemingly progressive technology and the Indian identity. That being said, Amity University is not without critics. In an era of rising competition to get into college, some people believe that the university accepts people too easily, although standards when evaluating test scores tend to depend on the exact program to which a prospective student applies. In addition, others argue that this university profiteers off its students. Nevertheless, Amity University has legitimately earned awards that attest to its success. India Today ranks it as the number one not-for-profit private university. QS ranks it among the top universities in Asia. Finally, as a matter of fact, Amity University has filed more patents than any other university in India. With courses offered in seventy-six areas of study, although it may not be considered an elite university, it certainly is a titan of education in India that has credentials that cannot be ignored. No matter the criticism Amity University receives, no one can deny that what it does and continues to do is incredibly novel within India’s economic system. It may inspire other entrepreneurs to invest in private educational environments for Indian youth. Whatever the case, Amity University has a unique story that people all over the globe may be interested in hearing.